A very rustic cabin nestled on the shores of Bowron Lake ideally suited for canoeists about to embark on paddling the lakes pr just finishing. The cabin was large cosy, and clean. There is no central heat but there is a great wood stove that kept the cabin warm all night. My only quibble is the hard and fast cancellation policy. The event we were going to attend, & stay st Beckers, was cancelled due to wild fires & smoke & there was no flexibility to cancel or receive a refund. Where to find Barkerville hotels near an airport? Where can I find hotels in Barkerville that are near tourist attractions? Travelers to Barkerville are advised to think about booking a place to stay sooner rather than later, as there isn't an extensive selection of lodgings close to Barkerville's downtown. The nearest Expedia hotel is the Mountain Thyme Getaway, British Columbia, which is 5 kilometres (3 miles) from the middle of Barkerville. 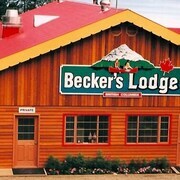 As an alternative, you could try the Becker's Lodge Bowron Lake Adventures Resort, located in Bowron Lake, which is 20 kilometres (14 miles) away. 25 kilometres (14 miles) away from the main part of Barkerville, is the Bear River Mercantile & Resort. After you have spent time in Barkerville, ensure you have enough time to investigate the other great attractions Cariboo - Chilcotin has to offer. Visit Cariboo - Chilcotin's ruins, old towns and history museums. Those who appreciate wide open spaces can also make the time to to enjoy the region's beaches, coastal plains, forests and rivers. In this region of Canada tourists might try their hand at snowboarding. If watching sport is what you love, be sure to visit Quesnel Twin Arenas, which is 65 kilometres (41 miles) to the west of Barkerville. Those sports fans wanting to sleep close to the action can take their choice from the Best Western Plus Tower Inn or the Quality Inn Quesnel. Quesnel Airport is located 65 kilometres (41 miles) from Barkerville. If you choose to stay nearby, you can easily secure a room via Expedia at the Gold Pan Motel or Willow Inn Motel. Are there hotels in other cities near Barkerville? What other types of accommodations are available in Barkerville? Explore Barkerville with Expedia.ca’s Travel Guides to find the best flights, cars, holiday packages and more!